KitMonsters – Mari Dangerfield. The music makers’ guide to making music. Mari Dangerfield is an emerging pop genius, a beguiling alt pop artist who bases her music around the Stylophone. Silky-voiced, she creates cascades of glittering hooks, and coaxes new sounds from her collection of the miniature analogue synths. She also produces her own tracks, composes, and is a member of The Stylophone Orchestra. We’ve the video premiere of her new single ‘Dear Admirer’, and talked to her about Stylopop, and her unusual vintage music gear. 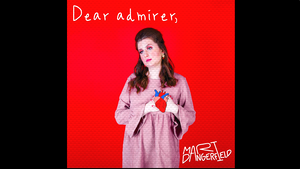 Mari Dangerfield is back with a new single ‘Dear Admirer’ that is a musical letter to the heartbroken. Mari’s spine-tingling pared back songs look at personal struggles, struggles of the mind, and how technologies affect the human condition. 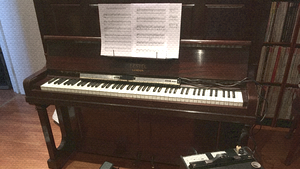 It kind of happened by accident – the first song I ever wrote was ‘Virtually’. It was originally a sad folksy-pop song by an 18-year-old who didn’t know much about synthesizers. Eventually, I realised I wanted to make the song sound electronic in some way because of the subject matter. I liked David Bowie and noticed that he’d used a little synth called the Stylophone on his single ‘Space Oddity’ and thought that if it was cool enough for him to use then I should have a go with it too! My first experiment of using the Stylophone was in a competition I entered that Mute records were running at the time. I ended up winning it and also loving the sound so decided it to stick with it for my debut and thereafter! ‘Dear Admirer’ started off more as a long poem full of little verses that didn’t necessarily join together but were somewhat related under the umbrella of ‘unlucky in love.’ Music-wise, the piano parts came first, followed by the melody and I eventually whittled the poem down into a song. When it came to the recording, I wasn’t entirely sure what direction I wanted to go in to start with. The demo had the lead and backing vocals with piano but I left figuring out how to make the Stylophone blend nicely into it ‘till the final recording. I recorded piano and Pianomate together then decided to double Stylophone over it and then simply bring them in and out as I felt worked. It seemed to work especially nicely in the second verse where the Stylophone and Pianomate have a little duet together in the accompaniment! I like the Pianomate for its unusual nature as a synth that isn’t a keyboard, and the ability to use it to add a dimension of sound to the piano or be used alone. It gives me everything between a mellow organ and a klunky synth. There’s a lot more I’ve yet to explore with the amp and mic input as well! My dream at 15 was to be a composer who wrote notes on a page, as I thought that’s what someone who wrote music was, but as soon as I got to uni and wanted work on student film and TV projects, I realised I needed to know how to actually create and record the sounds of the notes as well, so I started picking up tips from colleagues and tutors and going from there. I’m still always learning. The kind of things I’m still not great at are complex drumbeats and big ‘whooshes’, so I co-produce on those kinds of tracks and I don’t mind that as I like some of the aspects of a collaboration. I haven’t done much incidental music for a while, but I’m doubly glad I learned to produce for the sake of also deciding to make my own pop music. It’s nice having that independence and control over your sound, to be able bring your vision to life as closely to what you had in mind as that compared to if someone else just did it all for you. The Stylophone I discovered from being a fan of David Bowie and finding out that he’d used it in a few of his songs. I then started researching more into Dubreq and discovered a whole family of other instruments, some of which were kindly donated to me by Dubreq, others of which I was lucky to find for sale online. I hope to be able to acquire a few other Dubreq instruments in future, such as the Stylophone 350s (one of which I recently borrowed from Kingston University to record something with) and other quirky and vintage instruments. I like the stylophone for its ability to sound tiny and raspy or big and brassy and to be able to slide between notes on the keyboard is brilliant. I also like the extra quirks in the different models of the stylophone and the fact that when you record it externally, you also get the tap of the stylus so that’s like an extra percussive effect. 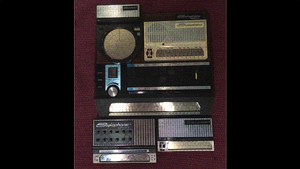 I found my first Stylophone S-1 by chance, lying around at the back of a music shop called X-Electrical, so that felt quite special. The main challenge of recording the Stylophones, especially the S-1 and Gen X-1 models, is their punchy high-end, which has to be carefully edited, usually note-by-note to ensure it sounds elegant and doesn’t overpower other things such as the vocal. That was a particularly big challenge with ‘Virtually’, where pretty much everything apart from vocals came from a Stylophone, but a really fun one! Recording externally with a mic also brings its own different set of challenges and joys compared to recording it via an interface. I love finding different ways to make the Stylophone sound beautiful and sometimes even like a completely different instrument. People say you have updated the stylophone sound for the 21st Century - is that through experimentation or using new technologies for example? I’d say it’s partly by default due to the fact that music technology has evolved significantly between now and when people were recording the Dubreq instruments in the 70s. I guess it’s also because not many people have put the Stylophone and modern electropop into the same bucket before (Stylopop is the correct term for the new Subgenre I’m told). Thirdly, I think it’s because ‘multi-tracked’ Stylophone is arguably a new way of using pre-existing sampling and editing techniques to make the Stylophone ‘flow’ as one polyphonic bed of sound. Until recently, when I joined the newly formed Kingston University Stylophone Orchestra, it had been one of the only instances of using the Stylophone for more than one aspect of a piece of music (i.e. as a single, monophonic musical part). I’m very excited by what we’re doing in the Orchestra now as well. 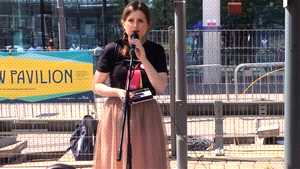 Over the Summer of 2018 during the Gigs Busking competition in London I had everything going through an amp which made it a bit tricky as sometimes some elements were overpowered by others at random points. 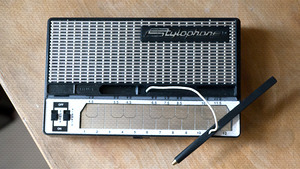 The Stylophone S-1, for example, can be especially loud, so having eq-ing and mix options is quite useful. I’m still experimenting with the best setup for live situations, but I think I’m going to go with some kind of foot pedal looper and trigger system to enable me to have multiple layers building and going at once. I feel like the new Stylophone Gen R-8, which I’m hoping to own at some point also, will open up possibilities considerably as well. It would be wonderful to have a band someday, but I’m really enjoying what I’m learning from the novelty of having 11 other Stylophonists to perform with in the Stylophone Orchestra. We’ve come up with our own reverbs and eqs to help blend us all in nicely. It took a while to work everything out but it was worth it! I can’t wait to hear the results in our upcoming live shows. I’m influenced by everything I’ve experienced musically I think. I grew up with classical music, TV themes or some kind of pop or rock always playing in the background. I’ve also loved the musical theatre for my entire life and the narrative as well as musical aspects very much feed into my work. In fact, I’ve just started training in composing for musical theatre as part of BML so that influence can only get stronger. My personality means that I feel the need to advocate my thoughts and feelings to help others and my music has become the vessel for that. My personal experiences and what I see other people go through is a big one I like to write about. Mental health is a key issue for me, and particularly how technology has come into conflict with interpersonal relationships; There are lots of very lonely people stuck behind screens pretending that they’re perfectly happy and that’s not good. It’s also because of technology replacing certain things that used to require human contact that we’ve all become a lot more isolated from one another and in some ways it seems like we’ve got lazier with our social skills as well. It’s not only about how technology conflicts with humans but also how it mirrors humanity, after all, the human condition/body is also a sort of technology/machine in a sense. I also love some what’s happening in the contemporary scene; I like relating to and engaging in the work that other current musicians and artists make.